1Q84 is Haruki Murakami's 900+ page magnum opus, and thus should be his ultimate artistic statement. This is what's expected from magna opera generally, and a number of critics lined up to agree. But the praise and adulation wasn't universal. Suffice to say, the book is polarizing. Action follows two narrators (though a third is introduced late in the game): assassin and gym instructor Aomame, who exclusively kills abusive husbands and other violent misogynists; and aspiring novelist Tengo, who is contracted to ghost-write a fantasy novel by enigmatic teenager Fuka-Eri, who is the daughter of a well-known cult leader. As events unfold, it soon becomes clear that Aomame's and Tengo's actions have a profound impact on the fabric of reality itself, thus drawing the ire of the Little People--malevolent, powerful gnomes of unclear motivation, but who command the cultists as their followers. Aomame and Tengo each come to realize that they no longer inhabit the year 1984, but the parallel reality of 1Q84. The book largely deals with their growing understanding the peculiar laws of action and reaction in this parallel reality, and the slow coming together of their narratives. Let me begin my saying that I generally love books like this. David Mitchell's CLOUD ATLAS is a personal favorite of mine, and Roberto Bolaño's 2666 is possibly the best novel I've ever read. I had hoped that 1Q84 would read like one of those--long, but intricately structured, horizon-stretching fiction of the first order. 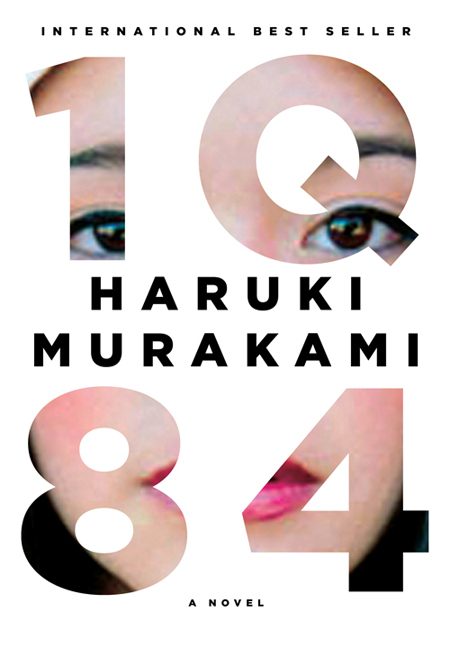 In that sense, I was disappointed: 1Q84 possesses neither the inspired, complex plotting of CLOUD ATLAS, nor the exquisite prose and psychological intensity of 2666. Or, to use a metaphor, imagine you've just scaled Mt. Everest and K2 with the help of reliable and wise sherpas. Now you'd like to scale a third Himalayan peak, only this time the sherpas have been replaced with a vegan hippie who not only has a bad sense of direction, but periodically insists you stop to play hacky sack or listen to Phish. You might enjoy scaling the mountain, and certainly its breathtaking vistas, but that hippie is going to drive you nuts. 1Q84 is a lot like that. That's not to say 1Q84 is bad--it's not. But it is a profoundly frustrating book. As a writer, Murakami is endlessly repetitive, and prone to giving his characters unnecessary soliloquies that summarize information already presented and understood by the reader. The book is also full of cliches that will be familiar to anyone who has read manga or watched a decent amount of anime, but which are not deconstructed or explored in any profound way. Compounding matters, these are often presented in chapters that do little to advance the plot, and even less to broaden our understandings of the characters. Then there's the Little People, who appear out of nowhere and then sort of just slip out of things without much fanfare. Not only that, they reminded me so much of the Underpants Gnomes from SOUTH PARK that, invariably, I got that song stuck in my head every time they showed up. Great, now it's stuck in my head again. ARG 1Q84!! So yeah, at times I pretty much wanted to take the book and throw it out the window. At other times, though, it was mesmerizing. Murakami does do weird pretty damned well, and I like weird. When he hits his stride, particularly in the third segment of the novel, 1Q84 is hard to put down, and deeply affecting. There are passages that will stick with me long after I've put it back on the shelf, and I found the book's resolution both satisfying and moving. I've never been so conflicted about a book in my life. In the end, most of 1Q84's problems boil down to the fact that it's about 300 pages too long. Though some authors can write this much and not waste any space, this is decidedly not the case with 1Q84. And it's not just the pointless recap passages, but also his endless use of stock phrases (if I ever have to read another passage about so-and-so making himself a "simple lunch," I may scream). This book should have been more carefully edited, and trimmed of its fat. Had that happened, this would have been a much stronger novel. As it happens, though, the problem isn't just too much space wasted on uninteresting things, but also that not enough space is dedicated to the stuff that really is interesting, like Tengo's family history. 1Q84 also could have used more deliberate plotting. Instead, it feels as if Murakami is making things up as he goes along. I know Murakami loves jazz, but an improvised trumpet solo on a standard is not a good model for the sprawling plot for your 900+ page novel. Maybe that's appropriate for someone who has been described as "Kafka with an iPod," but it's also about as annoying as the term "Kafka with an iPod." Penalties: -1 for this books is way, way too long; -1 for that's partially because he keeps repeating himself and summarizing things the reader remembers and doesn't need summarized; -1 who was editing this thing, anyways, because there's also all this cool stuff that's just dropped after a tantalizing tease; -1 for apparently no one...ARG 1Q84! !